June 6, 2018 (New York, NY) – While Airbnb has benefited from a surge in overall digital travel bookings, its growth is being hampered by increasing competition and guests’ concerns over safety and security. As a result, in its latest forecast on shared lodging users, eMarketer has lowered its projections for Airbnb usage. In 2018, Airbnb will have 38.4 million users* in the US, up more than 13% over 2017. However, in its previous forecast last year, eMarketer projected Airbnb would have 43.2 million users this year. 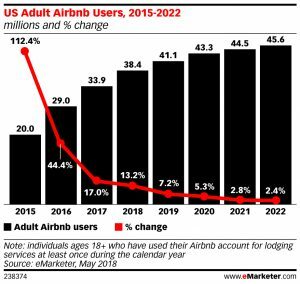 In fact, eMarketer is now expecting Airbnb to add just 6.1 million users in the US by 2021, far fewer than the 17.6 million previously predicted. eMarketer expects Airbnb to focus on mobile engagement by both new and current users, as the company taps artificial intelligence (AI) and virtual reality (VR) to create a more robust app. The likely goal is to capture more of the 54.3% of smartphone users who research travel—or the 31.6% who book trips—via smartphones. 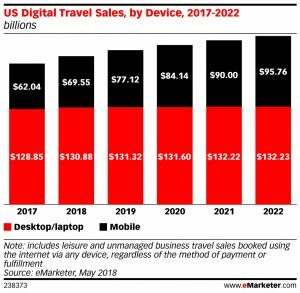 Digital travel sales in general in the US will grow 5.0% this year to reach $200.43 billion**. About 35% will come from mobile, while 65% will come from desktops and laptops. While more than 80% of the 147.2 million digital travel researchers will use a mobile device to plan a trip this year, a smaller percentage will use a smartphone or tablet to actually book the trip. About 64% of the 122.0 million travel bookers will use a mobile device. **Digital travel includes airline, car rental, cruise, hotel, accommodation and transportation. It includes all leisure and unmanaged business travel sales booked using the internet via any device, regardless of the method of payment or fulfillment.